1905: A bill that would make collegiate football a a felony is introduced in the Nebraska Legislature. «1950: Just a year after being named head coach at Nebraska, Bill Glassford entertains an overture from his alma mater, Pitt. If he were to leave, it would be the Huskers fifth coaching change in six years. 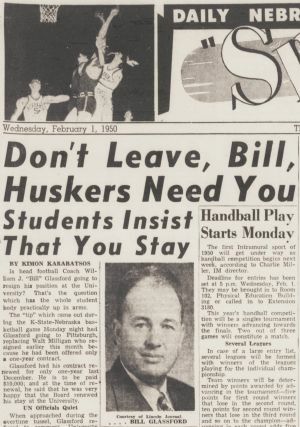 The Daily Nebraskan begs him to stay. 1990: Former Huskers Tom Rathman and Roger Craig combine for three touchdowns and 184 yards rushing and receiving in the San Francisco 49ers' 55-10 Super Bowl trouncing of the Denver Broncos. Also, Tom Osborne announces his candidacy for Congress. 2000: Tom Osborne announces his candidacy for 3rd District seat in the U.S. House. 2005: Nebraska and Adidas* renew their deal for apparel and footwear. 2010: Records obtained by a Tampa newspaper show that Husker offensive coordinator Shawn Watson* applied for South Florida's top job, which went to Skip Holtz.